In his new book, Allan Armstrong questions the traditional British Left view, which sees the birth of the 'New Unionism' in 1889 as the 'annus mirabilis' of Labour history. Instead, he looks to the 'New Departure' of 1879, which launched the Irish Land League, as the key point in a widening economic, social and political challenge to the British ruling class. The example of the struggle in Ireland contributed to the Highland Land League's successful electoral opposition to both Tories and Liberals in 1885. This in turn inspired the early setting up of the Scottish Labour Party in 1888. It also had a major influence on the setting up of the (Social) Democratic Federation in 1880/4 and the Scottish Socialist Federation in 1888. Many activists in these organisations became leaders in the 'New Unions' after 1889. This challenge was heralded by Michael Davitt's work in the Land League and Irish National League. He developed a strategy of 'internationalism from below' to unite workers, tenant farmers and the landless in Ireland, Scotland, Wales and England. 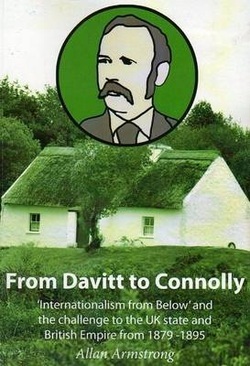 When Davitt's Radical Lib-Lab and Nat-Lab alliance foundered, James Connolly began to develop a new socialist republican workers' alliance to take Davitt's 'internationalism from below' on to a higher political plane, after the triumph of High Imperialism in 1895. Connolly's formative political years were spent in Edinburgh. Allan Armstrong is a republican, Scottish internationalist and communist. A now retired teacher, he was a trade union activist and remains a member of the Scottish Federation of Socialist Teachers. He was also the former chair of the Lothian Anti-Poll Tax Federation and is currently on the International Committee of the Scottish Socialist Party and co-editor of Emancipation & Liberation.